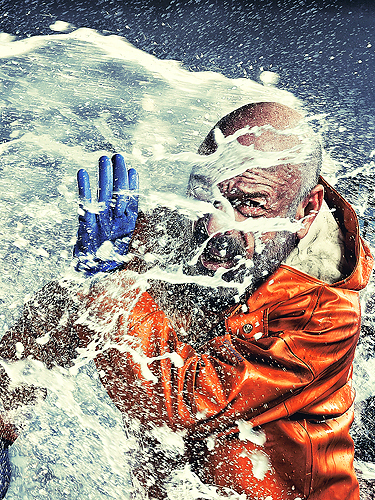 Finally, the time has come that I can show the first photo from this years Deadliest Catch campaign. With so much production people behind the scenes, a veritable laundry list of people are due a proper thank you for this photoshoot. The photoshoot was actually produced in Arizona with a multi-set studio being built, one inside, and one outside. It was a testament to our nerves of, as we had about 10 packs and about 15 lights on a subject that saw around 50 buckets of water mixed with milk, detergent and dirt thrown on him repeatedly. Not to mention the 3 wind machines that blasted his face to the point of rawness and ear plugs. Blair, excellent work! I know this wasn’t a easy shot to pull off. It is truly spectacular.